Half a century after the success of the last exhibition of the treasures of the ancient Egyptian boy-king Tutankhamun to hit the French capital, a new exhibition, this time at the Grande Halle de la Villette rather than the Petit Palais, is displaying more than 150 treasured pieces from the tomb of the young Pharaoh to thousands of appreciative visitors to the exhibition in Paris. 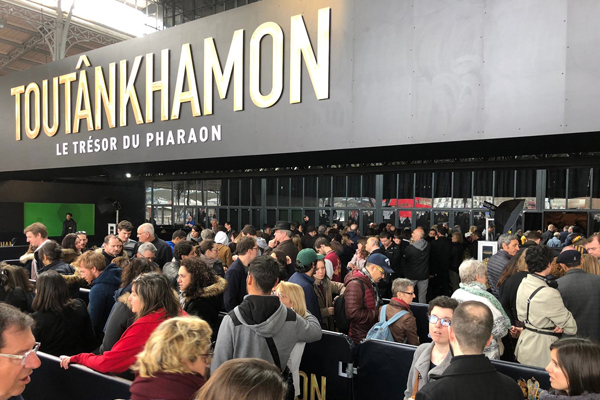 Paris was seized by Egyptomania this week when the “Tutankhamun, the Treasures of the Pharaoh” exhibition opened for its second stop after opening in Los Angeles in the US last year. Streets, shops, buses, the metro, the façade of buildings, hotels and restaurants were all plastered with posters of the symbolic golden coffin of the boy-king, one of the pieces in the exhibition, or of a gilded wooden statuette depicting the king riding a black leopard, or of the Ka, a wooden guardian statue with gilded head-dress and skirt and gold jewellery studded with coloured precious stones. 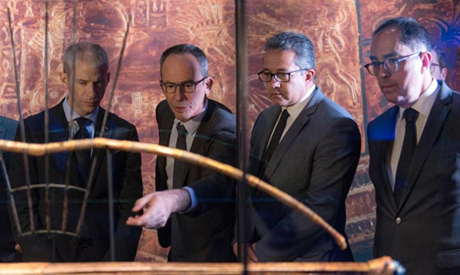 The mystery of the golden king has stirred up worldwide curiosity since the discovery of his tomb in 1922, and now the “Tutankhamun, the Treasures of the Pharaoh” exhibition in Paris is fascinating visitors yet again. 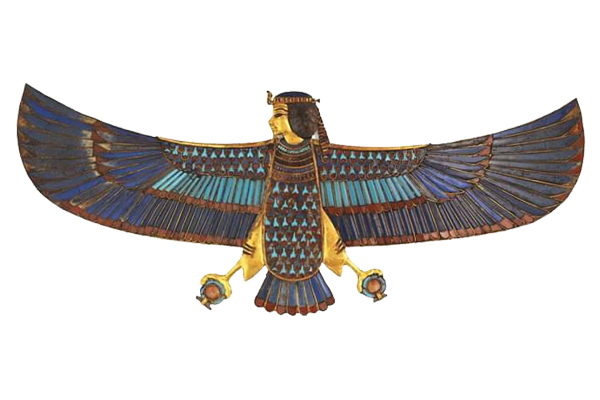 It features 150 pieces, 60 of which have never before been seen outside Egypt, and its theatrical design and exhibition scenario helps to reconstruct the path of the king into the afterlife. The gate of the Villette exhibition ground was glittering with the name of Tutankhamun this week, while the Grande Halle’s galleries were transformed into an ancient Egyptian necropolis with dark walls and soft lighting. Giant screens showed films documenting the work of British archaeologist Howard Carter in discovering the intact tomb of Tutankhamun and its treasures, taking visitors back in time to the early 20th century, with strains of oriental music filling the air in the display areas. Before going into the exhibition, visitors enter an immersive environment that begins with an introductory film on a 180-degree screen meant to transport them to the Valley of the Kings on the west bank of the Nile at Luxor where Tutankhamun’s tomb was discovered. The camera sweeps across the mountainous and desert landscape. Groups of men studying maps, digging rocks, or sifting sand are shown. Visitors then enter the first room of the exhibition proper, where images, lighting and sound are used to create the impression of the imminent finds. During the nine-gallery exhibition that follows, guests pass through the six gates of the underworld as they travel with the king on his journey to eternity. 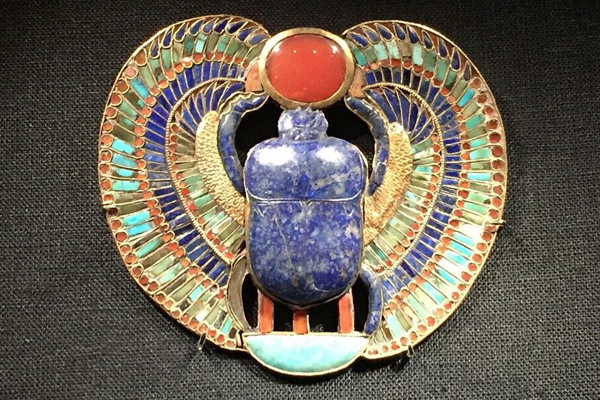 Along the way, they encounter good-luck amulets, weapons meant to fight off demons, alabaster containers of oils that the ancient Egyptians believed enabled the king to see and hear in the underworld, and figurines of gods meant to guide and protect him. The second gallery is dedicated to the gods. 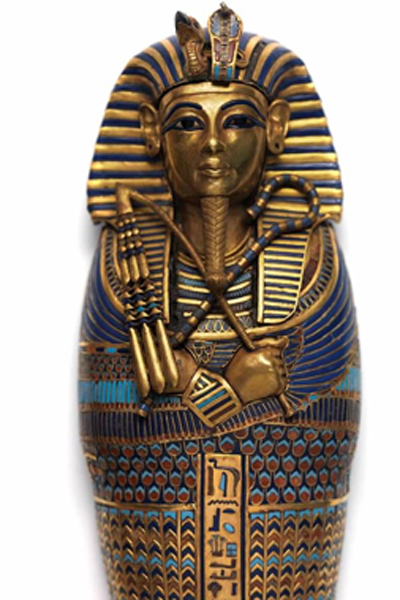 It is here that one finds the most impressive pieces, including the king’s guardian, a powerful black-and-gold statue that has watched over the king’s sleep for nearly three millennia, and a delicate miniature sarcophagus that contained his embalmed viscera. Then comes the king’s rebirth, illustrated by an arch of light evoking the journey of the god Re from sunrise to zenith. This room presents the fabulous treasures found in the boy-king’s burial chamber, including bracelets, tiaras, amulets and ornaments in which gold and precious stones mingle. The penultimate part, using video and digital images, evokes the discovery and study of the mummy. The last room leaves visitors facing a colossus in stone representing the boy-king. 3D scans of objects are shown on video screens on top of the display cases, so viewers can zoom in and spin objects on screen for an interactive experience. “There’s a lot more technology in this exhibition when it comes to being able to help tell the story. With these videos, visitors really get to see these objects in a way they have never seen them before,” John Norman, director of exhibitions of the IMG company that organised the show, told Al-Ahram Weekly. For the next six months, the Grande Halle de la Villette will display 150 magnificent objects from the collection that has captivated French audiences since its first tour there in the 1967, he said. Dramatically laid out in nine galleries, it relates the story of one of the most interesting and perplexing kings in ancient Egyptian history almost 3,300 years ago. Each section showcases the dazzling craftsmanship of ancient artisans that characterised the earlier Tutankhamun exhibition. Norman said the exhibition used multimedia displays to stimulate interest in the science related to archaeology. Visitors also learn how the scientific analysis of the boy-king’s 3,000-year-old mummy had revealed new information about his health and lineage, as well as how cutting-edge archaeological tools were assisting in discovering tombs and analysing existing ones in ways never before imagined. The last galleries in the show focus on the discovery of the tomb itself and the history of Egyptian archaeology, along with new scientific analyses of the mummy. These are provided through a video table showing scan data of Tutankhamun’s mummy. The scans are from 2005, but advances in technology have made it possible to glean more information from them, including that Tutankhamun had a club foot and an impacted wisdom tooth. New DNA testing shows that the young king also suffered from malaria and had a badly broken left leg above the knee that pierced his skin. This likely resulted in the infection that caused his death. The exhibition takes visitors through the afterlife, visualising it through objects from the tomb. It combines technology, music and animation in novel ways. “We have used a lot of technology in the exhibition,” Norman added, describing it as “a very theatrical experience”. He said that each gallery space had its own music to ground viewers in ancient Egypt and provide context for the exhibition. Egypt’s Minister of Antiquities Khaled El-Enany, who officially inaugurated the exhibition along with French Minister of Culture Franck Riester, described the exhibition as an “appetiser” for French audiences to encourage them to travel to Egypt to admire the rest of the king’s collection in its final resting place at the Grand Egyptian Museum (GEM), due to open in 2020. “It is a message of peace and security from Egypt to the whole world,” El-Enany said. He also highlighted the strong friendship between Egypt and France, adding that archaeology had always had a special place in the hearts of the French, who had contributed a lot to it over the last two centuries since French Egyptologist Jean-Francois Champollion deciphered hieroglyphs in 1822. During his speech, El-Enany highlighted the recent discoveries and inaugurations of archaeological projects carried out by the ministry last year. He also invited the French public to witness the announcement of three new discoveries within the next few months and to visit Egypt to see the transportation of the royal mummies from the Egyptian Museum in Tahrir Square to the new Museum of Egyptian Civilisation in the Cairo district of Fustat. Some 200,000 tickets have already been sold for the Paris exhibition, with 5,000 people visiting the exhibition on its first day and queuing outside la Villette. It is expected that the number of visitors to the Paris exhibition will reach one million people before it travels to its third stop in London. “The exhibition is soothing and most moving,” whispered Séverine, one of the first-day visitors to the exhibition. She said the darkness of the exhibition design provided “a beautiful atmosphere which brings out the gilding”. “What is impressive in this exhibition is seeing that almost everything is intact,” Séverine continued, fascinated, like fellow visitor Sylvain, with the figurine of Horus, one of the oldest Egyptian deities, and amazed by the details and materials used. “To know the techniques that they had at that time is just incredible,” he said. Sylvain had anticipated the crowds, and like his friends he had bought a ticket in November for the exhibition. Jean-Marie, at the exhibition with his children, had also bought tickets three months ago to be sure to be able to get in. 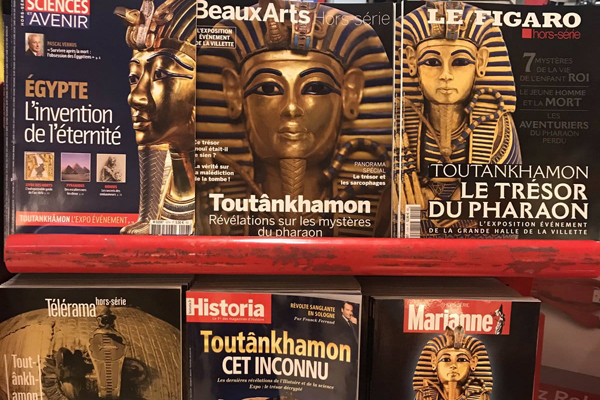 He had good reason to be present on the first day, as he had also been half a century ago at the first Tutankhamun exhibition in Paris at the Petit Palais. “I visited the exhibition 50 years ago when I was ten years old, which is the current age of my daughter,” he said. In 1967, “the exhibition of the century” attracted more than 1.2 million visitors, a record never equalled. “I absolutely wanted to pass this on to my children because it is a great moment of emotion for me. It is of an absolute and timeless beauty,” Jean-Marie told the Weekly. Tutankhamun seduces all generations, however. “What is amazing is that there is gold everywhere. It is a precious material, and you get the impression that the ancient Egyptians had lots of it,” said one 13-year-old visitor. Janette, an 80-year-old visitor on the second day along with her two friends, was found in a corner of the exhibition crying. “We are very sad,” Janette told the Weekly. “Fifty-two years ago when the Tutankhamun exhibition was first in Paris we came to visit it. We were then four friends, and now we are only three as our fourth friend passed away a few months ago. We were hesitant whether to buy tickets and go to the exhibition, but we decided to do so in order to make our fourth friend happy. But upon our arrival we could not stop crying as we see her all around us,” Janette concluded.